LAS VEGAS -- By today’s professional bass angling standards, Guido Hibdon had a tiny amount of lures at his disposal when he won the 1988 Bassmaster Classic on the James River in Virginia. Today’s pro bass anglers carry cases of lures, plugs, jigs, worms, grubs, spinnerbaits, swimbaits, buzzbaits – and they’re constantly looking for more. In addition to being one of the top pro anglers throughout his career in the 1970s through the 1990s, Hibdon, 67, also continues to be an innovative lure developer. It’s an industry, he said, that continues to evolve. For the 1988 Classic, Hibdon put together a short-armed spinnerbait with the help of Luck-E-Strike. Another lure he used, he admits regrettably today, was created by a competitor in the industry. Testing lures is an ongoing process. Hibdon said he and his family – including his son Dion, the winner of the 1997 Bassmaster Classic on Logan Martin Lake in Alabama – will work with lures for up to a decade before putting them on the market. There are even some he’s tried to keep in his bag. “It’s kind of like the Guido Bug was,” he said. “We keep it quiet forever and then the first thing you know, I’ve got a guy in the boat with me and I didn’t know he was press. He took pictures of it.”Browning said the quality of lures today are much better – “More durable, for sure,” he said. 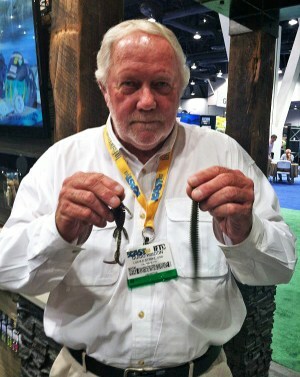 At ICAST and other conventions, there are plenty of gimmick lures to wade through. But the manufacturers quickly realize these gimmicks don’t have much shelf-life if they’re not catching fish. While that helps the angler, it’s not always enough for the lure manufacturer. “Some of them, they just don’t sell,” Hibdon said. “There’s been a couple different ones, we still use them, but for whatever reason the public just didn’t buy them. That’s part of it. Hibdon then gestured toward Renosky.